When I say very vanilla, I mean it! Not only can you see the flecks of vanilla bean throughout the pudding, you can taste the vanilla. It’s not at all subtle, which is why I puffy heart this recipe like whoa! I’m becoming more conscious about the food I eat. Each year I get a little pickier and a bit more scrupulous when it comes to the food I’m putting in my body. Sure, I’m still going to eat dessert–gummy bears for life, yo!–but I’m getting better at balancing my diet. I tend to eat healthy throughout the day and splurge a little at night. I’ve been all about the ice cream lately. I’m not lying when I tell you I eat this Very Vanilla Chia Pudding every. single. morning. during the summer. I’m boring like that. Once I find something I love, there’s no shaking it. When I originally started making this recipe, I used a combination of raw cashews and water to create the base of the pudding. I made it like that for months and loved it, but then I discovered Silk‘s new Protein Nutmilk, so I decided to test the recipe using 2 parts water and 1 part of their Protein Nutmilk. The outcome was an even creamier, silky smooth pudding that packs even more protein per serving. I was sold! Silk Protein Nutmilk packs 10 grams of plant-based protein per serving and only 2 grams of sugar. It equals out to 80% less sugar than dairy milk. If you’re worried about calcium, don’t be–Silk contains 50% more calcium than dairy milk. The added pea protein creates a thick, creamy cup of nutmilk that’s silky on the palette. This Very Vanilla Chia Pudding is naturally gluten-free, dairy-free, soy-free, vegan-friendly, and naturally sweetened. I used a combo of medjool dates and maple syrup to add a subtle hint of natural sweetness. This pudding is a blank canvas for toppings. I like to pile mine high with seasonal fruit and homemade granola, but it’s also tasty with a drizzle of roasted almond butter or swirl of jam. Place chia seeds in a large bowl. Split the vanilla bean in half lengthwise and scrape out the seeds. Add the vanilla seeds to a high-powered blender and place the vanilla pod in the bowl with the chia seeds. Drain and rinse the cashews, and then add them to the blender with the vanilla seeds. Add the remaining ingredients to the blender. Secure the lid and blend on the highest speed for 1-2 minutes, or until the mixture is smooth and creamy. Pour the mixture into the bowl with the chia seeds and whisk to combine. Allow the mixture to sit for 10 minutes, whisking a few times to help disperse the chia seeds and prevent clumping. Transfer to an airtight container or divide between individual mason jars and place in the fridge to for at least 2 hours or overnight. The pudding will stay fresh for up to 5 days in the fridge. When you’re to serve, top with your favorite fruit, granola, nuts, seeds, or almond butter. The possibilities are endless. Ooo! I didn’t realize Silk has nut milk with added protein! I tried chia pudding once but wasn’t sure about it, but I love the ingredients you used here, I want to try it again with this recipe. 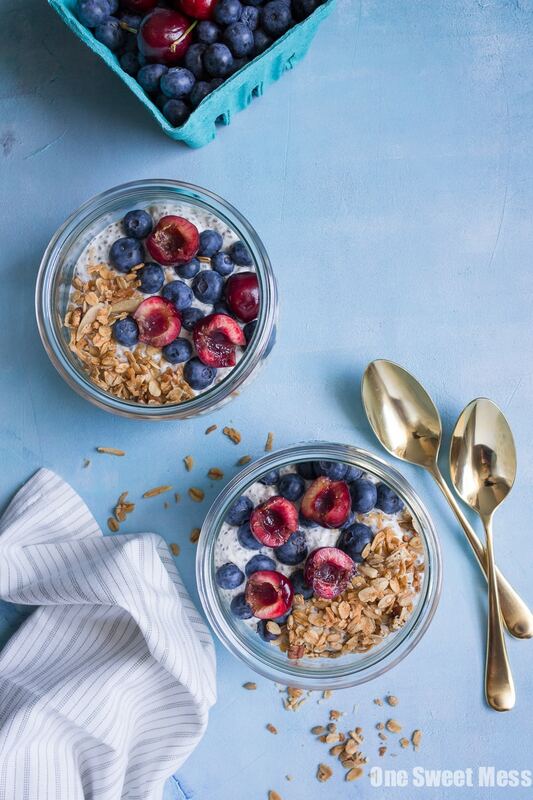 Love chia pudding so much and this one looks yum! I really need to get on this chia seed bandwagon! Thesel ook great!